I am a big fan of the high carb vegan lifestyle, because you can eat as much as you care for, lose weight, and most importantly, keep the weight off. Being a high-carb low-fat vegan means keeping a diet consisting mostly of fresh fruits (bananas, mangos, melons, pineapples, and dates are great choices), vegetables (leafy greens, carrots, potatoes, and sweet potatoes are great), and a small amount of daily calories that come from healthy fats. Please do not think the sugar from whole foods like fruit is ever going to make you fat! Every cell in our bodies is running on glucose, which is the sugar mostly found in fresh fruits. 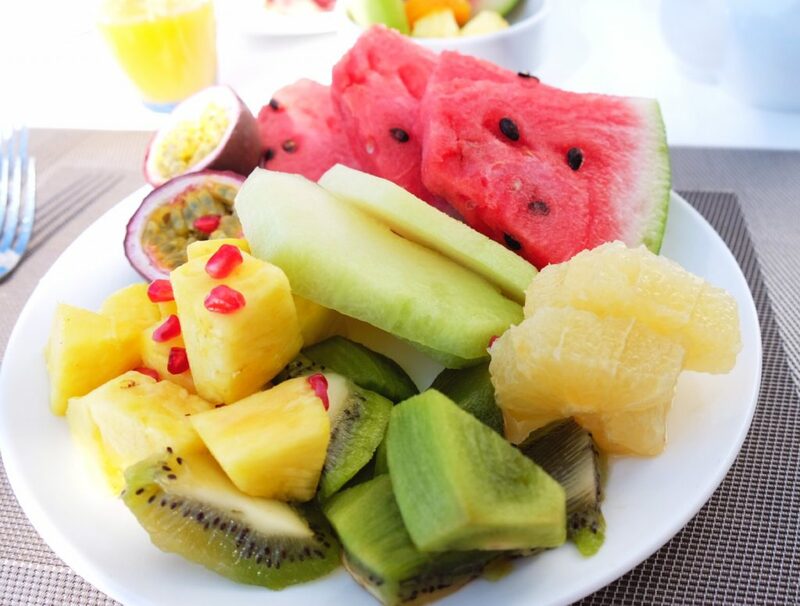 Fruits are the easiest foods to digest and a great source of quick energy. The difference between natural sugar found in fruits and processed sugar is the high amount of water, fiber, vitamins and minerals in whole fruits. This means the sugar is entering the blood stream slowly while the food is being digested, resulting in balanced blood sugar levels, which is the key to losing weight. So here are my best tips for losing weight long term! These days we always hear what is NOT in our food (gluten-free, sugar-free, grain free etc). I think it is so much more positive to focus on what we add to our food, instead of what we cut out. Tell yourself how great you feel because of all the colorful fruits and vegetable you are adding to your diet, which are all so yummy and packed with all the nutrients we need. That way you concentrate your mind on the positive message. This tip makes a huge difference and quickly brings you to where you want to be. It’s great to focus on your goals but don’t overstress and put your body under too much pressure. My tip is to keep yourself busy with all the other things that have to be done, and to adopt a healthy lifestyle naturally. “Leave out all foods with a label” was the best advice I have ever received. It makes so much sense once you think about it. Processed foods contain an enormous amount of additives, such as preservatives, sugar, salt and other weirdly named chemicals. Eating only fresh foods will give you the most energy and the fastest weight loss results. Oils are 100 % isolated fat, which means the fat is going straight to our blood system and can cause cell damage and other inflammatory reactions. Although I recommend you eat very little fats in order to achieve optimum weight loss, I do suggest you eat whole foods like avocados, in case you are craving healthy fats. Water!! Water!! Water!! I can’t stress enough about how important it is to drink a lot of water. 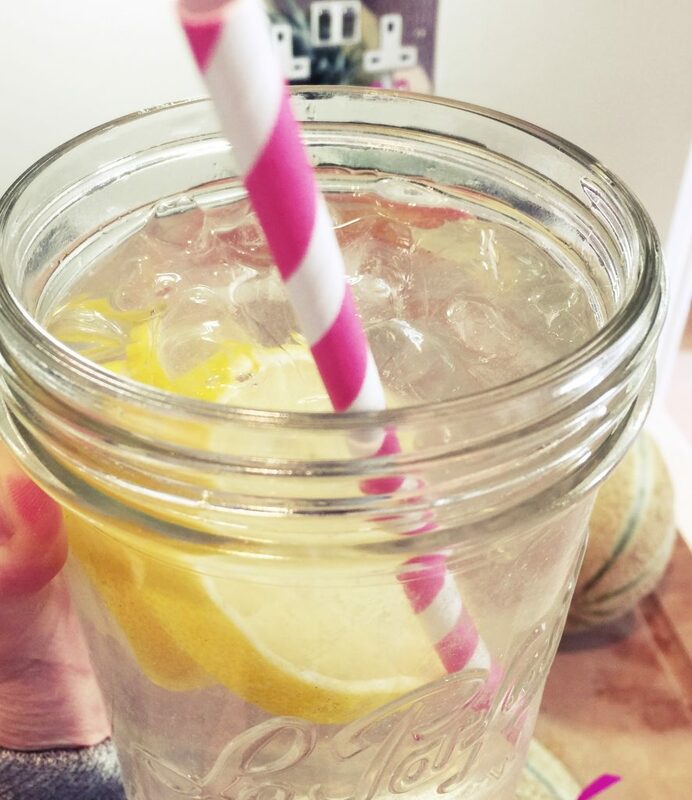 Drinking enough water will make it so much easier for you to lose weight. Start your day with 1 liter of water and add the juice of one or two fresh lemons. Your digestive system will get an extra kick and your body will be ready to eliminate toxins. Working out will make you healthy, strong and lean. It is so much healthier for our mind to focus on getting our heart pumping because we want to stay fit, and not because we want to lose weight. The weight loss comes naturally and is a positive side effect. I suggest you work out whenever you feel like it. Some people prefer to start the day with a run and others prefer to end the day with a yoga session. Find something that you enjoy and have fun with. Don’t beat yourself up for taking a day off. Eating a high carb vegan lifestyle will already do 80% of the job, so there is no need to stress about going to the gym every day. I love your page and you are so inspiring! I would love to have a body like yours and stay stabel. So I was wondering, you eat about 2/ 3 avocado’s per week but how many times per week do you eat bread? And you say you try to eat mostly raw, what is your mostly light raw recipe for salad? 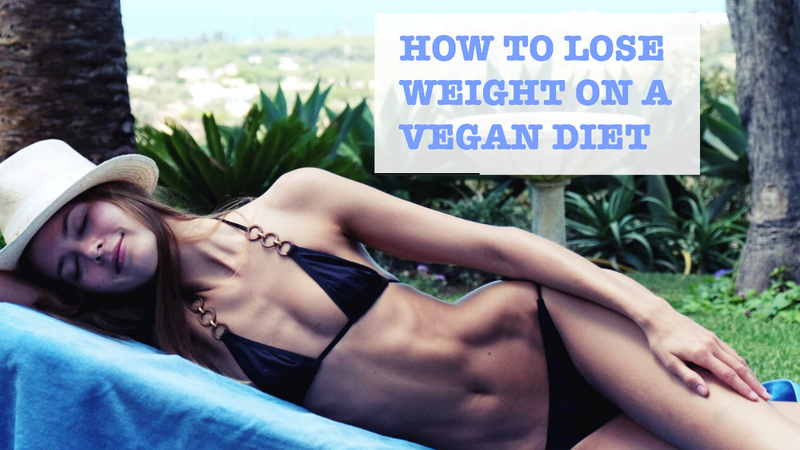 I am trying to become vegan but most importenly for me is to lose weight. I’m afraid I’ll be eating to much bread& avocado’s & banannas and not enough raw meals. If I cook one meal per day, is that ok or to much? Hey!! I like your lifestyle sooo much !! I am a professional athlete like basketball player! And I make very hard weight lifting and also pilates. And I am a vegetarian life style but I couldn’t stop to eat only fish and egg. Cause IAm thinking like I need that proteins…. What do you think ablut that? And also I wonder can you share your program like what you eat all day long , like when you wake up which pill you Take , whst are you eating? Thanks for Everything!!!! Hi Caroline, thanks for all the tips. In addition to drinking water/lemon, would you recommend drinking fresh 100% aloe vera juice? I hear the benefits are great. If so, please could you recommend a brand that’s free of preservatives, consisting of aloe vera juice alone? I’m looking for one but haven’t come across any so far. Your help would be appreciated. Thanks a ton! Hi Jennifer, apologies for the delay in getting back to you. Yes, i love ALoe Vera juice and add it to water and smoothies. It´s a great booster for your digestion! I get mine at Koro“>koro where you can also get the 5kg date box that i buy. I’ve been inspired by your Instagram for almost a year now and would really love to try out your vegan lifestyle! I really would love to lose about 10 pounds to get to my ideal weight. I see a lot of controversy on the internet that it’s possible to gain weight if you eat too many calories on a vegan diet. If I eat raw vegan with no oil or salt and low fat, would it be possible to gain weight? Why would that be? Thank you so much!! Aww I´m so happy to hear that!! Really means a lot. How long have you been eating a raw vegan diet? I can’t imagine someone gaining weight on this lifestyle unless you are coming from an Eating disorder and have to gain weight to be healthy. my tips are to do more exercise. Try to do 45min of cardio at least 4 times a week. You. eed to get your body moving to boost your metabolism and to get more toned & fit. Nutrition vise it seems you are doing everything right, however if you dont workout at all it takes a lot longer until you see changes in your body. Other important factors are sleep & stress. Try to get 8 hours of sleep every night and eliminate stress as much as you can. Also worrying about your body is stress for your body. I started to eat more fruit last week and became bloated. The tone in my stomach wasn’t as noticeable due to how much water and how bloated I was. I work out daily. I don’t eat high amounts of salt, so I was just wondering how you eat so much fruit and don’t bloat? I wanted to try a mono breakfast and lunch of watermelon but was afraid to bloat again. By the way I was eating watermelon, apples, pineapple, cantaloupe, grapes and berries. Will the bloated just go away with time? 1.Eat fruit mono meals. My fav mono meals are ripe banans/ honey melons or watermelon. 2.Dont drink water while you eat. Drink 1 liter in the morning and wait 30 min before you eat. Also wait around 30 min afterwards before you drink water again. 3.Only eat ripe fruits (bananas are ripe when they are spotty) 3. Never eat fruits after cooked food as fruits digest much quicker. 5. Do 30min of cardio each day to boost your metabolism. Hope that will help you! I am following your posts on Instagram and your blog quite a long time and I really, really love nearly everything you share with us/your community. Thanks for that! So thank you for all the inspiration, advices, nice pictures and wonderful texts! Only one question about the dates: I normally buy them in different shops here in Hamburg but some comments before you wrote something about ordering on amazon… Are these dates as good like in Israeli Shops etc.? thank you so much! Thats so sweet. :-)) It took me more than a year on this lifestyle to see first changes in my body, however, I always felt that eating a high percentage of raw food in my diet really helps a lot. I love to eat fresh fruits ans dates during the day and only have 1 cooked meal per day, mostly for dinner. Workout vise cardio helps the most!!! You get a good sweat, boost your metabolism and burn more fat. Running, spinning and boxing are all amazing workouts that will get you toned without building up lots of muscles. Hi, Caroline. I wonder if homemade peanut butter (just toasted peanuts) is a bad fat? I live in a country, where avocados quite expensive, so can’t buy them every week. And also, does morning workout before breakfast help to loose weight? 1. working out before having breakfast definitely helps with weight loss. If you workout on an empty stomach your body will start burning fat right away where as if you eat before your workout, the body first burn the calories from the food and then starts to burn fat. Cardio like running and spinning are amazing to start the day. Have lots of water and 1-2 large fruit platters afterwards for best results. 2.Fresh peanut butter is a great source of protein and fat, however, if you are trying to lose weight, a low fat diet with a high percentage of raw fruits will work better. While I think it’s great that you want to share your vegan lifestyle with others (I am vegan also) and promote healthy eating and a positive attitude towards health, I also think it can be slightly dangerous with the information you are giving these highly influential young girls. It just really worries me that giving advice like this when you aren’t a nutritionist or dietician is alarmimg, especially about fats, oils and carbs. I know you aren’t saying that you are an expert, but as a public figure you are extremely influential and I would advise you have all the information you need not from the internet, but from people who really know what they are talking about. I was once one of these girls who listened to people like freelee etc with a high carb low fat diet and I got really sick, lost weight in a bad way, and became deficient in a lot of things, I’m just lucky I spoke to a health professional and am now studying nutrition so I can understand how bad it was for me in what I was doing. I’m not saying what you’re doing is bad, each to their own but your lifestyle may not work at all for someone else’s and can in fact be very detrimental, especially for teenage girls that are still growing and need so much nourishment to live a healthy life. So please please please know what you are saying has consequences. i appreciate your concern. :-) However, I did study nutrition and know what I am talking about. 🙂 I am promoting a healthy diet that is full of fresh fruits and vegetables and low in processed foods. I am always telling my followers that its important to eat in abundance and to never ever restrict yourself. A high carb vegan diet has endless health benefits and is not about dieting. I eat more than 2500 calories per day, often times more and have experienced so many positive side effects from this lifestyle that I want to share these with my followers. On top of that I have gotten many messages from the people following me saying that they feel amazing on this lifestyle and am so thankful that hey have found my Instagram, & Blog. This is about being happy with yourself, treating your body well and getting the fittest and healthier version of you and not at all about deprivation. Last question – do you eat any chocolate at all? Even if it is vegan? Do you eat B12 vitamin supplement? Do you eat chia seeds or oats? And how about edamamme / soy beans, do you eat those? Do you ever eat bread, cake or anything containing flour? I appreciate your concern. However, fruits and vegetables have all the amino acids we need and it is totally fine to eat a high carb vegan diet without supplementing protein. In fact, have you ever heard than someone was protein deficient? Its all about eating an abundance and correct food combining. Did you know for ex. that drinking coffee leads to a week protein absorption? There are many other parts that play a big role in regards to protein. Thank you for beinf so inspiring. I am really trying to stick to a healthy diet, the same as yours, and I find myself doing great for a couple of days, and then having enormous cravings and binging, not even out of hunger, just because I feel like I need grains or sugary things. I also get very bloated and have stomach pains when eating vegetables, should I only have vegetables in monomeals as well? What do you suggest I should do? I am also terrified of gaining weight so I feel like forcing myself to eat 2500 calories would be emotional suicide. Do you have an idea of what I should eat for a couple days/week to get back on track and forget about the cravings? thank you so much! Happy to hear that you feel inspired. Cravings only come when you under eat. It is really important to eat enough on a high carb vegan diet in order to be satisfied. The website cronometer.com is great for counting calories/ vitamins etc. to make sure you are eating enough. 1. Start your day with 1 later of lemon infused water and ideally only drink water until your first bowel movement. 2. Eat Fruit mono meals meaning one type of fruit at a time. For ex. ripe bananas for breakfast, mangos for lunch, dates as a snack, potatoes for dinner. Do that for a few month if possible, it really helps. 3. Drink enough water throughout the day. I usually drink 3-4 litres. 4. Do cardio. Running and spinning wakes up your metabolism and really helps your digestion to function better. 5. Get enough sleep and don’t eat 2-3 hours before going to bed. I admire your page and health journey! I am 19 and live in the US. I have a few questions for you:) How did you know a high carb diet was for you? I am currently unsure of what diet route to take; high carb or high protein. I have read that high protein is best for losing fat, but I don’t know if the sources are trusty. I feel as though I hold a lot of my fat in my tummy area, and I’d really like to change this. I am very active, so I know it is my diet that needs to change. Do you have any advice? I have always loved fruits and really enjoy eating a lot of fresh fruits, dates etc. Fruits give you the carbs you need where as a high protein diet will always lead to cravings bc your body is not getting enough carbs. I would suggest you try the high carb vegan lifestyle and see how it goes. I am sure you will feel amazing and have tons of energy! High protein is really not good at all for losing fat, in fact really the opposite. Anyway: Now, some days after I have started the diet, I feel weak all the time and I don’t even have power left to workout because my whole body is shaking as soon as I’m working out, although I’m doing everything as you suggest. Do I do something wrong or is it just my body who tries to getting used to this new lifestyle? Did you have similar problems at the beginning? The most common mistake people make when they first come to this lifestyle is not eating enough. Fruits and vegetables are naturally low in calories and we need to eat a minimum of 2500 kcal per day to thrive on that lifestyle. I sometimes eat more than that depending on how active I am. I just want to say that I admire what you’re doing. I’m trying too to have a vegan philosophy and your blog and your Instagram account are really helpful ! World should be full of people like you, sweetheart. thank you so much!! Thats so sweet of you!! Glad to hear that you find it helpful:-)! You’re such an inspiration, I love all your social media platforms!! You mentioned you liked to have a salad for dinner every 2nd day; when it comes to dressings, what do you use? I know that some can contain lots of salt and oils. Hi caroline, if i really need to lose weight, do you think i should still count calories? I have troubles realizing when i’m full and therefore often binge out of boredom or whatever. So i feel counting calories might help. But i do understand it puts more stress on the body. What do u suggest? I love your blog! I was wondering if you ever eat peanut butter or other nut butters. I know there are high in fat but I’ve heard it’s all the good fat, just like avocados. What’s your opinion? Sorry I have another question I forgot to include haha. I know you eat dates a lot but they have a really high calorie count. Even though these are healthy, you still have to eat them in moderation so you don’t gain weight, correct? What is your serving size of dates usually? can you give me a meal plan to lose 3 kilos? Hi,can i know how old are you and how much do you weigh? i really want your body btw!!! What you say sounds right and is my opinion too! I dont really like its taste but i eat it as a Source of Protein. what is opinion about Soja? Do you count calories ? If so how many a day? I heard that salads make you bloated, have you heard of such a thing ? Hi my name is Rachel…I started eating mostly vegan and my belly bloat had decreased…you’re an inspiration to me every day to eat right and I was wondering what your body measurements are? thank you so much!!! Makes me so happy to hear that:-)! I never take measurement or weigh myself to be honest. I just love the abundance of this lifestyle and feel like weighing myself or counting calories is not the right approach and not a good way of comparing ourselves to others. Hope you understand :-)!! I love your YouTube videos!!! Please make more! You give such amazing advice and you inspire me everyday! I’m actually on a macrobiotic diet which is kind of like vegan , except you can eat a little fish 2-3x a week, and I’m allowed to eat a LITTLE dairy bc I like to have milk in my coffee…do u know anything about this diet? U have an amazing body and what are your body measurements? aww thank you so much!! Im sooo happy to hear that as I am still new to doing videos and wasn’t so sure about it! :) Yes, i have heard about your diet! I think its great as it is so much healthier than a standard meat focused diet!! 🙂 Maybe try to substitute milk with almond milk to make your diet even healthier :)! Hi Val, thank you so much! :-)) I think the lack of energy probably might come from not eating enough. It helps a lot to have a banana smoothie, some dates or a few apples before working out. The best way to keep the weight off after being fully raw is to implement as many raw days as possible into the vegan lifestyle. Try to eat raw till 4 and also focus on cutting out oils, salt and vegan junk food. Basically the more natural the better.:-). I also find that dates are the best way to prevent sweet cravings as they are so sweet and satisfying!! i think almond milk is a great substitute to regular milk. However, if you don’t feel well drinking it maybe try to have smoothies for breakfast instead. Try to make a 5 Banana, 5 Dates + Water Smoothie, its super creamy and looks like a milk shake :))) Also make sure you drink enough water to prevent getting a headache. Around 3 liters are great if you can manage that. I have been vegan for little over 1 year now (and vegetarian before that). My diet has not been as “raw” and fruit based as yours, but I would be interested in trying. I believe that my problem has also been that I try to restrict the food almost too much (to salad, vegetables, good fats) and avoiding to eat more fruits than 1-3 per day. I can sometimes feel, that I ruin my metabolism by eating too little. However, if I now were to try to change my diet to be as similar as possible to yours- meaning that I would add more fruits and eat less “good fats” etc.. Do you think that I will gain weight at first when changing the diet? Will the high amount of carbs and sugar (from fruit) make me gain weight in the beginning? How fast do you think I will see results? I would also want to loose 3-4 kg of weight. I am sure you will be able to lose weight long term but please don’t focus on weight loss as this is such a negative mind set. Focus on being fit healthy and most importantly happy. The longer you are on that lifestyle the better you will feel. Hi Caroline, are dates not fattening due to the high amount of sugar they contain? no not at all. They have zero % fat and its all natural good sugar. I eat A LOT of dates and never gained any weight from it. Have a look at my post about the benefits of dates. Hey Caroline do you eat banana ice cream or blend your fruits, or do you prefer to eat them whole and unblended? Hi Brittany, i love to eat them whole and unblended but smoothies are such an easy way to make breakfast if you have no time. During the week i usually make a large smoothie in the morning, have one at home and take one with me. Homemade fruit smoothies are way better than fruit juice because you get all the fibre. thank you so much!! It definitely takes time and the longer I’m doing it the more I see the benefits which motivate me to stay on that lifestyle. :-) The key really is to be consistent and it will become so much easier over time until you don’t even think about it anyone. My dress size is usually small or 34-36. I have been vegan for an year now and feel so good with myself since I struggled, and sometimes still do, with eating disorders. But I really don´t see a change in myself fisically only spiritually. Looking at you so slim and happy makes me question what should I do to feel completley pleased with this wonderfull vegan diet. You are a hell of an example. There are a few things i have noticed. 1. It takes time and consistency. I have been eating “high carb low fat” since i started being vegan a bit more than 2 years ago but i have always been eating tons of fresh fruit and vegetables even before that. It really depends where you are coming from and results are different for each of us but i strongly belief that it takes time to see the full benefits of this lifestyle and the longer you do it the more you see changes. 2. Vegan doesn’t automatically mean healthy. This is one of the biggest mistakes people make. Vegan can be quite unhealthy if you don’t consume a lot of fresh, whole foods. Try to eat as much fresh ripe fruits, vegetables, greens .. as possible, make your meals simple, don’t eat vegan junk food, drink tons of water, enjoy treating yourself well and start to love yourself, workout a few times a week, ..all these things play a huge role. I literally very very similar you, and of course I looooove fruit too!! hclf is the best way of eating definitely and it makes you feel amazing I second that!. Anyways I was wondering how often do you workout and what is usually your workout? Do you have an ab or legs routine to share?. Lots of love, Im so happy I found your page. I workout around 4 times a week at the moment. I love running, spinning and boxing! The combination of cardio and boxing works really well for me and i feel like boxing tones the whole body. I always recommend to do cardio a few times a week as this will boost your metabolism and get your heart rate up. Hi Natalia, i have been vegan for a bit more than 2 years now, so thats about it. It has never been easier to stay in shape as it’s almost impossible to gain weight on that high carb low fat vegan diet. 🙂 Hope that helps. i love rice. However, i am not a big oatmeal person as i love to have fruits, fruit smoothies or green smoothies for breakfast. Try to eat MORE fruits for breakfast and make larger smoothies, that way you probably feel more satisfied and i always felt than fruits & fruit smoothies are easier to digest than oatmeal. i love rice! However, I’m not a big oatmeal person. Fruits are always best when eaten alone without any grains etc. but if you feel like it fills you up more I would totally go for it :-))! Banana – date smoothies are great in the morning and I love a Mango, spinach, parsley smoothie:-)! I would like to have your body! it is perfect! Could I say how you measure weight and to have a goal? What about bread, pasta, meat or fish? Love, you are a very inspiration! Brown rice pasta is a great substitute and is much easier to digest than regular pasta. :-) My best tip to satisfy sweet cravings is to eat dates!! they are so sweet, delicious and healthy and you will crave less chocolate etc. If you still want more sweet you can make healthy alternatives like sweet potato brownies. For bread i love rye bread but it may not be ideal if you are trying to lose weight. I’ve been vegan for years, because I’m against animal suffering. But, apart from this, sometimes I feel that I don’t eat healthy enough and that I need a cleaner body. Could you please give an example of your perfect idea of breakfast, lunch and dinner, so I can have a guide of what to eat in a day to have a super healthy and clean vegan diet? thank you so much!!! :-) Have you seen the what i eat in a week post ? That might help you. 🙂 I eat a lot of fruit during the day and feel soooo good doing that!! You are going to feel to energized, light and are getting the healthy sugar you need to function properly. Def recommend eating fruits during the day and having a hearty, veggie filled dinner! apologies for the late response. Have you seen the ‘what i eat in a week’ post? Let me know if that helps:)! thank you so much!! So glad to hear that you feel inspired:) I don’t really like chia or flaxseeds. Hi Caroline- I’m wondering how you get sufficient protein since you don’t seem to eat much quinoa or legumes or nuts? I understand we do not need meat and dairy to get enough protein but it was my understanding that we need a little beans/ nuts/ seeds every day on a vegan diet to support our tissues sufficiently. Also I see you take a B12 supplement which is great- can you tell me which one/ or type you would recommend? Lastly how do you get Omega 3 if you don’t eat flaxseeds or chia? 1.You can take chlorella and Spirulina which also have protein. 3. an organic liquid B12 supplement. My fav one is chlorella as it also contains protein and other B vitamins. So you don’t eat bread/ pasta/ meat / fish nor chocolate?! Basically fruits and vegetables? hi Caroline! what type of date do you usually buy and where? super love you blog!! thank you so much! So glad to hear that! 🙂 I LOVE Medjoul Dates. Luckily, I find them everywhere these days. :-) Small Israeli shops are great as they always have the freshest ones. Amazon can be good to as you can order a large 5kg box. 7hotdates is a great address if you live in the States. Hi Caroline, how much nuts are recommended to eat per day? How many dates do you eat in a Day? Do u eat them instead of food or just like a extra snack? I Also wounder how you do when you go out to dinner at a restaurant with friends, dont you eat at all ? I eat around 20-25 dates a day, sometimes more sometimes less. I can easily eat a mono meal of dates for lunch as i love them so much, especially this time of the year where there are not so many sweet fruits in season. I love to go to restaurants with friends and i think think it is so much fun to enjoy healthy food together. Don’t let being vegan ruin your social life. 🙂 You can cook for your friends and family and show them how tasty healthy foods can be, you can bring them to your favourite restaurants (Asian, Japanese, Vietnamese, Chinese restaurants always have vegan options) and you almost always find something on the menu in a non vegan friendly restaurant. Is coconut milk an isolated fat? Coconut oil is an isolated fat. However, coconut milk is made of water and coconut meat which means its not an isolated fat. Try to use a brand that doesn’t use additives or sweeteners. Hello, do you think that it’s safe for women to eat minimum of fat in their diet? I used to have problems with period and my doctor recommends to pay atention to my fat intake. yes it is totally safe for women to eat minimum fat. However, low fat gets often misunderstood with no fat. I eat around 2-3 avocados a week and consider that low fat. It is good to do a blood test first to find out if you need to supplement vitamin b 12. I personally like take a liquid supplement. Im woundering IF you eat quinoa and rice? Do you eat Every fruite and vedgetables or just some? Hi, do you mind to share your workout routine? at the moment i go running 2-3 times a week for 45 min and go boxing 1-2 times a week deepening how busy i am. I also love spinning classes and started to do a 10 min abs workout after boxing :-).